Kittie’s Warriors attended the 2018 Muscle Car & Corvette Nationals at the Donald E. Stephens Convention Center in November. Their main goal was the raise funds and awareness for their program and over the two day event they well surpassed their fundraising goal. Sherri McKinney and Kristina Russell we awarded the “2018 Leading Lady Award” by MK Insurance. Kittie’s Warriors attended the 2018 Bloomingdale Septemberfest with the goal of raising funds to provide grants to cancer patients in need. This was the programs first public event and the support they received was overwhelming. The Kittie’s Warriors Corvette was unveiled at the event and caught the eye of everyone who stopped by the booth. They surpassed their fundraising goal and plan on attending the event again in 2019. The Pediatric Brain Tumor Foundation is the world’s leading nonprofit dedicated to the childhood brain tumor community. They serve the more than 28,000 U.S. children and teens battling brain tumors by investing in the most promising research and providing practical, informational and emotional support to families. Kittie’s Warriors was invited to participate in this great event to support pediatric brain tumor research. Supporting in particular, Team Abigail. 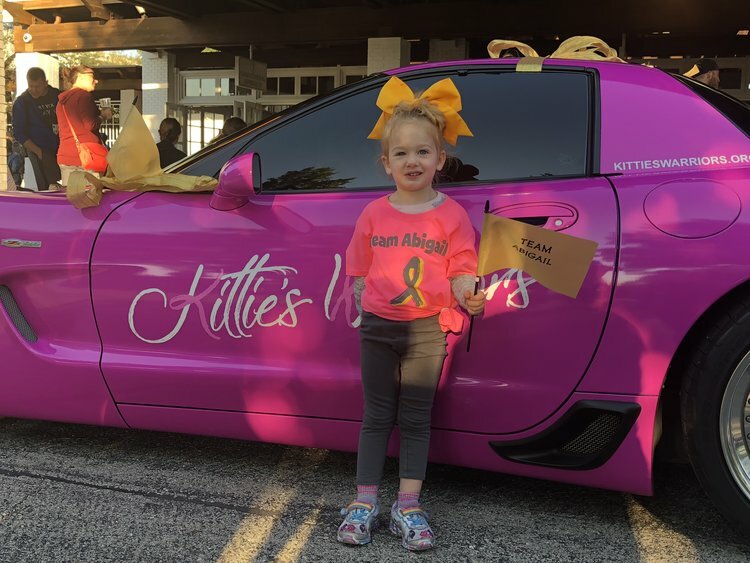 Brian Schmidt’s pink Kittie’s Warriors Corvette was the pace car for the event and the children were given the chance to get in the drivers seat for a picture. There were smiles all around and we are honored to have been able to participate in such a big way. Abigail is a true warrior. GO TEAM ABIGAIL! Kittie’s Warriors was a hole sponsor for the 2018 Play for P.I.N.K golf fundraiser hosted at Hawthorn Woods Country Club on September 7th. Since 1996 Play for P.I.N.K. has raised $52.8 million for the Breast Cancer Research Foundation.